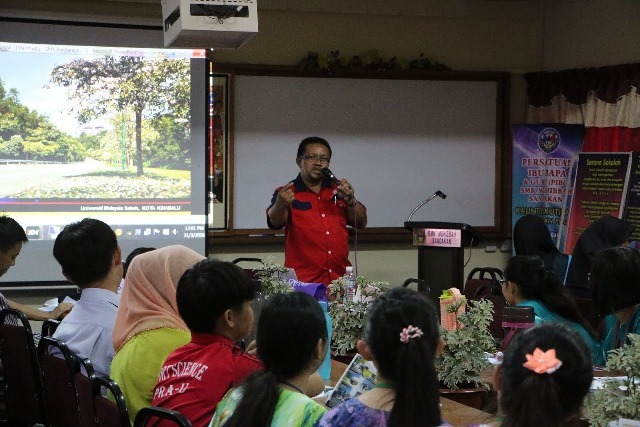 MONDAY, 4 APRIL – The Faculty of Science and Natural Resources (FSSA) recently organised a programme called ‘A Step to the Ivory Tower Series 2’, focusing on Form Six students and Sijil Tinggi Pelajaran Malaysia (STPM) school graduates from schools around Sandakan, Tawau and Lahad Datu. Deputy Dean (Academic and International) FSSA, Associate Professor Dr. Abdullah Bade said this programme among others aimed to provide an opportunity to prospective students to learn more about the programmes offered at FSSA, fostering interest in forestry that had great potential whether in the industry or as a career. “The programme selected some schools such as Sekolah Menengah Kebangsaan (SMK) Muhibbah Sandakan, Sekolah Menengah Kebangsaan Agaseh Lahad Datu and Sekolah Menengah Kebangsaan Kuhara Tawau as the location. “It is hoped that this approach would stir the students’ interest to continue their studies under the programmes offered by the faculty, particularly for the coming student intake in September 2016/2017,” he said. Meanwhile, Head of Science and Mathematics, Pre-University of SMK Muhibbah Sandakan, Shim Lhi Shwo suggested such programmes be intensified not only by UMS but also other higher learning institutions, in future. “The briefings given were very meaningful and included a discussion on the importance of science subjects, the criteria for undergraduate programmes application, student activities, career prospects and facilities offered by UMS. This would give a clearer overall picture and study options that could be selected by students at the next level,” he said.